Who would have thought a sport like Pathfinder could ever exist, particularly on a planet where the baseline for survial is already off the charts on the difficulty scale. Yet, in so many ways, it is fitting that the colonists that already live on the edge, continue to push the threshold, to go that one step farther towards precarious existence. According to the sources within the immigration council, there has been a 25% increase in applications from Earthers looking to immigrate to the colonies. Could Mars' popularity be directly tied to the risky sports we play, the way we live our lives and how we face adversity? This is the stuff that makes the population of an entire planet collectively feel pride. Today, the final stage in the Men's Pathfinder Marathon concluded in epic fashion. From the pool of 53 men that started 8 days ago, only 18 remained to face Melas Chasma, the deadly vertical ascent and the race along the rim of the canyon toward Marineris. Alan Sawyer takes Stage 5 for Columbia Hills. The climb not be merciful and was quick to claim the first victims. Pylypovych (KMH) withdrew shortly after passing the 1/2 way mark , "I stopped to rest, thinking I would catch my breath. After 30 minutes sitting on that ledge, I knew I was finished. It was no longer safe for me to continue." Carlos Fernandes of San Olympus and favourite Gunvir Pachehra would both fall at the steepest point. Fernandes would be finished due to a broken hip. But for Pachehra, it would seem, two cracked ribs on top of his broken wrist wasn't enough to stop him. He was a man on a mission. Fredrick Mallette was forced to drop out just metres from reaching topside. His equipment, taxed over days of competition, started to fail. With a system failure warning in his EV suit that he was unable to silence, he was disqualified by officials, leaving a battered Pachehra and Samual Gates as the last representatives of Europa. Even after the punishing climb, the relatively straightforward course that remained continued to weed out the pack. One by one they succumbed to exhaustion, literally dropping mid-stride. Nicholas Buruk of KMH who had held 1st position after the ascent and Jason Zhuan, winner at Calydon Fossa, conceded well before the final stretch. It would be Alan Sawyer who would enter Marineris first. Upon crossing the threshold into the airlock, Sawyer took Stage 5 with a time of 7 hours and 29 minutes. Marshall Shannon (HDX) came in second at 7 hours and 51 minutes, followed by Owen Dubad of Marineris 7 minutes later. Dubad tore off his helmet and called out, "It's good to be home, Marineris! ", to the cheering crowd. 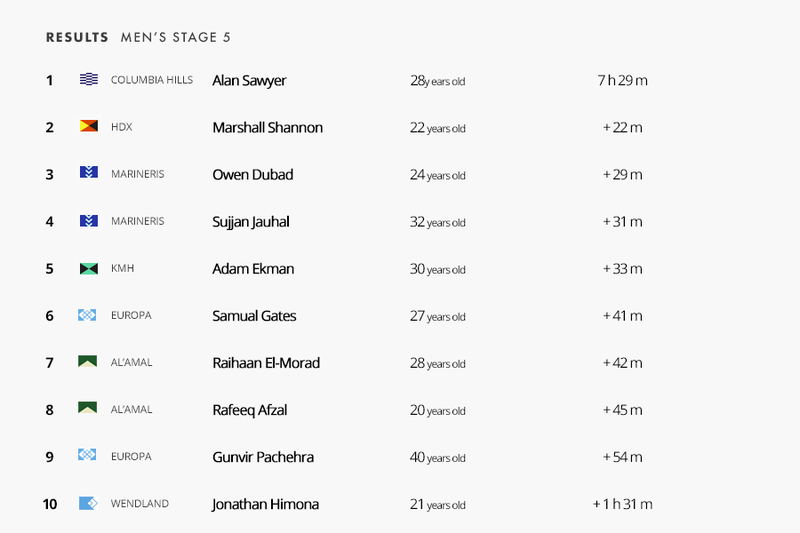 Favorite Raihaan El-Morad finished in 7th position while a broken, but jubilated Pachehra successfully crossed the finish line in 8th position, where he was immediately whisked away by a waiting medical vehicle. Only 19% of the starting pack made it through all 5 stages; a reminder of how incredibly difficult the challenge is. Final award ceremonies will be held tomorrow evening after the completion of the Women's Stage 5 run.